On this Black Friday I hope everyone got all of their shopping done. I for one decided not to do Black Friday this year for a couple of reasons, the main one though is because this year I decided to host Thanksgiving at my house. Yep! I was soo proud, but very tired by the end of the night. I made turkey with all of the fixings and a cake, 2 pies, cheesecake and cookies. 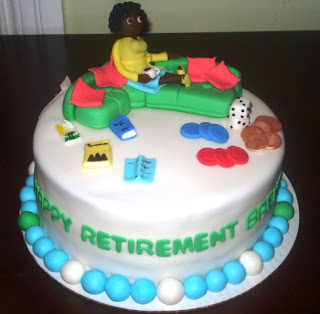 Pictures of the desserts will be posted tomorrow but I want to show you all this really cute retirement cake I did on Wednesday for a client who requested a cake for a woman who was retiring. The woman loved to travel and gamble so I had to include both of those themes on the cake. My client sent me a picture of a cake she came across on the website of a cake she liked. I took the photo and of course changed it so it reflected more of my style and the woman who the cake was for. In all I really love the way the couch came out and the way I got the female figure to sit cross leg on the couch. I did learn that trying to put slippers on a figure is harder than I thought it was going to be and almost broke a foot off. LOL. So I know what not to do next time. Enjoy! The cake was Red Velvet with Vanilla Bean Buttercream Filling. 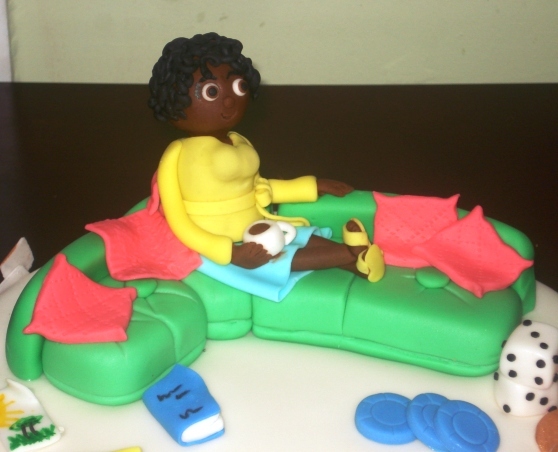 All of the items on the cake as well as the figure and couch was made from fondant. So because I moved, so things with my business is going to change. One big one is that after January 1, 2012 I won't be taking on big cake orders for the next six months. I am doing this in order to focus more on my house and getting things in order with the business so I can figure out my next move for the business. It will also give me more time to be with my family. My son is getting big so fast and I don't want to miss it because I am working 12 to 14 hour days in a shop. I will still be taking on wedding clients through out 2012 and smaller cake orders as well as cupcakes and cake pops (which have become very popular). Also if you haven't checked out my website www.kimakonfections.com please do so.. it has been completely revamped! I hope you all like the new layout. I wanted to make it more user friendly and I think that has been achieved. Today marks another special milestone in my life.. today is my son's 2nd birthday! My little man Jayden Makai Lamour came into world and has been going non stop since then. LOL. Next week I am throwing him an Angry Bird theme birthday party. So I will be posting lots of pictures. This is the first time I will hosting a party at the new house and it will be great! So that's all for now. I will be posting pictures of cakes I have done over the last couple of weeks as well as some cupcake/cake toppers that are now available.